Prooimion I: "O brothers, let us love the Bridegroom. Let us make ready our lamps, shining out with brightness and true faith; so that, like the wise virgins and the Lord's coming, we may arrive with him at the marriage. For He, the Merciful, since He is God, offers - as a gifts to all - the incorruptible crown." Proomion II: "Thou, O God, the Bridegroom of salvation, the hope of those who hymn Thee, grant to us, who pray to Thee, that we find - without stain - in Thy marriage, just like the virgins, the incorruptible crown." Prooimion III: "Now the time for virtues has appeared, and the Judge is at the doors. Let us not be dismayed, but let us go and fast; and let us offer tears, contrition and alms as we cry out: 'We have sinned more than the sands of the sea; but grant to all, O Creator of all, that we too may have the incorruptible crown.'" Strophe 1: "When I heard the sacred parable of the virgins, which is in the Gospels, I stopped, amazed, and pondered over my reflections: How was it that the ten possessed the virtue of immaculate virginity, and still - for five virgins - the suffering was fruitless; whereas the others shone with lamps of humanity? With the result that the Bridegroom drew them to Him, and led them in joy to the bridal chamber, when He opened up the Heavens and distributed - to all the just - the incorruptible crown." Strophe 2: "Shall we, then, seek out the grace and the way of life of the Holy Scriptures? For it is the guide for undying hope for all men, just as - indeed - all inspired Scripture has been ordained as helpful [Romans 15:4]. Therefore, let us fall down before Christ the Savior; and cry with fervor: 'King of kings, Friend of man, give knowledge to all. Guide us to Thy commandments, in order that we may know the way to the Kingdom; for we are eager to follow it, in order that we may have the incorruptible crown.'" Strophe 3: "Through this faith and assurance, most of mankind are eager to attain the Kingdom of God; and it is for this reason that they guard the virtue of virginity. Also, they practice fasting --- the greatest good work in life. They persevere in their prayers, and guard the dogma undefiled [Acts 1:14]. But charity is wanting in them; and for this reason, all is in vain. For every one of us who does not have mercy, does not receive the incorruptible crown." Strophe 4: "Some men making their way sailing, when all things are complete, if they lose the sail, will never achieve a straight course in the sea; for then the ship is checked in its course and remains idle, since it is not obedient to the skill of the pilot nor of the helm. Just in the same way, all those hastening to the Kingdom, even if they heap up the cargo with every virtue, [but] are devoid of mercy, they will not anchor in the harbor of Heaven; and they will not possess the incorruptible crown." Strophe 5: "Since the Judge of all considered the giving of alms better than all other virtues, He has given to men the teaching of this parable. He, in His wisdom, called wise the five virgins who brought their oil, and He called foolish those who came to the end of their journey without oil. Also, we have heard Matthew as he poured out the meaning of this. I think it pointless to go back over his words, for those who know the Scriptures; and so let us get to the point of this parable, in order that we may have the incorruptible crown." Strophe 6: "Full of significance is the teaching of this parable. It is the guide and path for all of us to humility and all mercy for men. It controls kings, and teaches compassion to the leaders of the people. Indeed, if anyone built and furnished a splendid house, unless he put a roof over it, his trouble would be in vain. In like manner, the one who has built an edifice of virtues, unless he has erected a roof of compassion over them, has lost his labor; and so, he does not attain the incorruptible crown." Strophe 7: "We are able to see the meaning of this divine scripture, if we raise up to Christ watchful eyes of intelligence. Let us expect to see - with the eyes of the spirit - the universal Resurrection of Christ --- Christ, the Saviour, appearing as King of all, He Who is now King, and Lord, and Master. And even if some rebel refuses to recognize Him, the flame of the fire will act as smelter for all men; for no one will be able to resist when he obtains the incorruptible crown." Strophe 8: "For we all know that the voice of the trumpet will suddenly, as the angel sounds it, raise up the dead who - through the centuries - awaited Christ --- the beautiful Bridegroom, the Son of God, our eternal God. When the cry suddenly sounds, all will be present; and those who are ready with their lamps filled with oil, will enter at once with the Bridegroom as inheritors of the Kingdom of Heaven. For then their faith, along with works [James 2:20], will justly give them the incorruptible crown." Strophe 9: "Almsgiving surpasses other virtues. In truth, it stands out as more brilliant than all virtues in the sight of God. It cleaves the air. It surpasses the sun and moon. It arrives, without wandering, at the entrance of the celestial world. And even there it does not stop, but goes up to the angels. It passes over the choir of archangels. It intercedes before God on behalf of man. It stands before the throne of the King, beseeching Him for the incorruptible crown." Strophe 10: "Shall we not, then, consider the five very wise ones arising from sleep as from a nuptial couch, and not from the tomb of the dead? For they had oil, and at once they equipped the lamps of the spirit. But the others, likewise, arose suddenly with them, with their faces gloomy and despondent; for their lamps were put out, and their vessels appeared empty. They tried to get oil from the prudent ones, who acquired the incorruptible crown." [Romans 8:21]; for He Who distributes mercy, the Creator, is the One Who gives the incorruptible crown." Strophe 12: "In exact terms, the wise virgins spoke: 'Go and ask the merchants who sell oil, if you can still purchase oil at this time.' The others are self-deceived, as foolish ones always are, and they hasten to make the purchase. Since the appropriate time for such business was over for everyone, it had slipped by and set a limit to the fruitless course of the foolish virgins. It called attention to their confusion at the time, and clearly put their clamor to shame. For they were asking the impossible and they were not sensible; and so, they did not gain the incorruptible crown." Strophe 13: "When they recognized the folly of their course, the five at last turned around; and they found the bridal chamber of Christ closed, and all of them - with mournful voices - cried out with groans and tears: 'O Immortal One, open up the door of Thy mercy to us also, who have served Thy power in virginity.' Then the King cried to them: 'The Kingdom is not open to you. I do not know you. Depart from our midst, for you do not carry the incorruptible crown.'" Strophe 14: "But once they heard Christ, the King of all men, crying to the five, 'I do not know who you are,' they were overcome with trouble. As they wept, they cried out: 'O most just Judge, we have guarded virginity. We have practiced self-control of every sort. We have observed feast days zealously. We have conquered the flame of the fire of licentiousness, and we have gained this end. We have always lived a pure life, in order that we too might have the incorruptible crown.'" Strophe 15: [The foolish virgins continue their plea to Christ] "But after these virtues and the grace of virginity, and after trampling down the fire of lust and the flame of voluptuousness, after many struggles, when we emulated the life of those in Heaven - for we strove to have the kind of life of the immortal ones - all these things of such great importance, as it seems, have been found without merit. We have shown the struggle for great virtue, and all of our hope has been shown to be in vain. Why, then, dost Thou pretend ignorance of us --- Thou who dost offer to all - to whom Thou dost will it - the incorruptible crown?" Strophe 16: [The foolish virgins continue their plea to Christ] "O Saviour, nod acquiescence. Open Thy door to us too, Thou Who alone art a just Judge. Receive into Thy bridal chamber Thy virgins, O Redeemer, Christ, and do not turn away Thy face from those who invoke Thee; so that we may not be deprived of Thine immortal grace, and so that we may not face shame and disgrace before the angels. 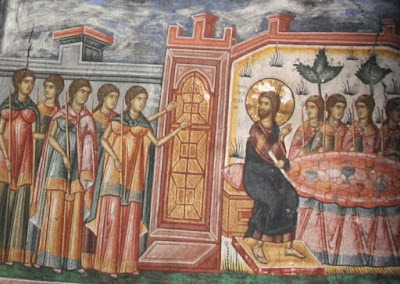 And do not ever permit us to stand outside Thy bridal chamber, O Christ. They have not practiced chastity any more than we have, those to whom Thou dost offer the incorruptible crown." 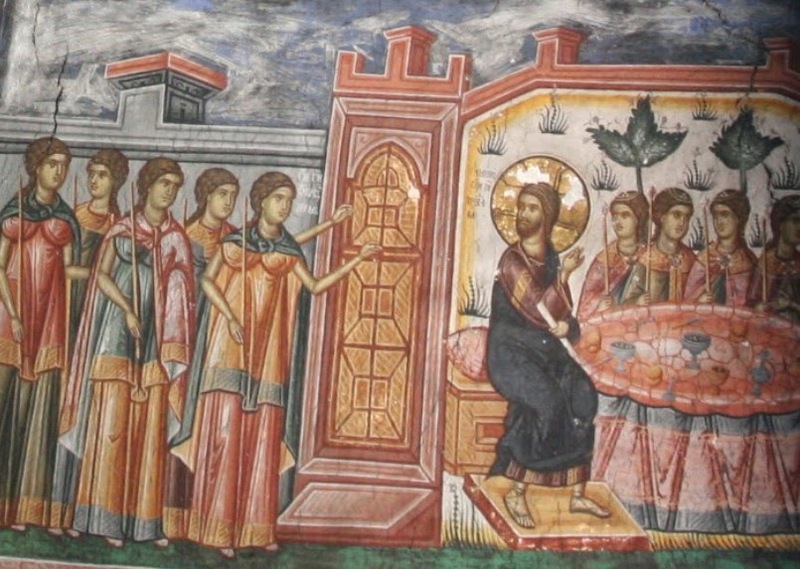 Strophe 17: "Christ spoke as follows to the foolish virgins who were speaking to the Judge of all: 'The judgment set out just now is just and in line with truth; the door of mercy is no longer open to men, since - indeed - the time for repentance has not been given men down on earth. He Who was merciful a short time ago is no longer sympathetic, but the Merciful One is a severe Judge. You who were lacking in charity in the world, how can you ask for the incorruptible crown?'" Strophe 18: [The Lord continues His admonishment of the foolish virgins.] "I am going to tell you plainly in the presence of all the archangels and all the saints the treatment I received from those who entered with Me: They found me in trouble and exceedingly hungry, and they hastened to give me nourishment; again, when I was thirsty, they gave me to drink with all haste; when they saw me, a stranger, they took me in as though a close friend; when I was held in chains, they cared for me; they visited me when I was sick; They scrupulously kept each of My commandments, with the result that they have found the incorruptible crown." Strophe 19: [The Lord continues His admonishment of the foolish virgins.] "Nothing such as this did you do in the world. You have kept the fasts; you have kept virginity; and - in words - you have kept virtue. But without completely reverent works, you have worked in vain. You have ignored strangers in need, and the sick; you have not stretched out a helping hand to the hungry. Hypocrisy alone has nourished you; always you honored harshness. In no way did you aid the poor who knocked at your door. How then do you seek the incorruptible crown?" Strophe 20: [The Lord continues His admonishment of the foolish virgins.] "Never have you given yourself to the point of giving pity for the naked and the newcomers, and you did not receive strangers under your roof. You presented deaf ears to those who were miserably in chains and under guard. You did not see those who were ill; you did not look with pleasant face on those begging in poverty and need. But you were always lacking in humanity, and you had pride rather than compassion. How, then, when you have done these things in your life, do you now ask for the incorruptible crown?" Strophe 21: [The Lord continues His admonishment of the foolish virgins.] "You looked on all people with haughty eyes; you scorned the poor; to all of them you were without sympathy --- without pity. You moved harshly against sinners: those who made a mistake everyday. You have an attitude of inhumanity toward those of your kind, as though you nevermade a false move, bragging of your uprightness. Again, you considered those who did not fast as rejected; and those who were married as loathsome. Only yourselves did you consider righteous, although you had not received the incorruptible crown." Strophe 22: [The Lord continues His admonishment of the foolish virgins.] "You practiced fasting without touching nourishment; but towards men, you made use of scorn and calumny. You did have chastity, but it was not pure; for you smeared it everyday with uncleanliness of words. What is the value of pompous virtue, if it does not have every thought completely holy? Of what value is it for someone to eat and drink and lead her life wisely, if indeed she fasts and harms those who do not fast? For how would she claim the incorruptible crown?" Strophe 23: [The Lord continues His admonishment of the foolish virgins.] "Fasting is not edifying, unless it has the power to remove all of the thoughts that are disgusting and the acts that are cruel; nor can self-control be strengthened in the flesh, if one spends one's life with no command of self. For there is a foundation stone of fasting, and in protection from danger it is necessary that it be placed as security --- as in building a house. Compassion makes it shine, and piety also enriches it. For these virtues guard it on all sides like a rampart, and procure for it the incorruptible crown." Strophe 24: [The Lord continues His admonishment of the foolish virgins.] "To what end, therefore, have fasting and chastity, along with vanity, helped you? You have denied gentleness, always you have loved anger; but I, Who am meek, love the meek --- granting them pardon. I deny those who have kept fasting but without mercy, and prefer to receive those who eat but are full of mercy. I hate virgins who are without humanity, but I honor those who are married and who love mankind. Marriage with self-control is precious; hence, it obtains the incorruptible crown." Strophe 25: [The Lord continues His admonishment of the foolish virgins.] "I have not sharpened a sword against sinners, but I had a gentle glance for men; I am the Maker of men. I received kindly the weeping harlot [Luke 7:37-50] and gave her pardon. I took pity on the tax-gatherer as he lamented, and I did not reject him [Luke 18:10-14]; since I saw the true repentance that lived in him. As Creator, I have shown Myself compassionate toward all. I took pity on Peter who had denied Me [Matthew 26:75]; I felt compassion for his tears when he sought the incorruptible crown." Strophe 26: [The Lord continues His admonishment of the foolish virgins.] "As for those who have entered with me into the marriage chamber, I say before all the world: They have zealously kept My commandments on earth. They have always been the protector of widows, and they have pitied orphans. They have had sympathy for those in grief and tribulation, and never have they closed their doors to the poor and to strangers. Always they ministered to those who were ill --- whom you considered as people to be rejected. I do not know you. I deny those who are without humanity; but to these others, I shall give the incorruptible crown." Strophe 27: "The chorus of angels marveled on hearing Christ, the King, Who witnessed for the five who entered with Him. O freedom of the saints of Christ, their very great boast! Before all the people, they brought the verdict of immortality. And also, before these wise virgins, the others received their last sentence; and they mourn bitterly - with endless lamentation - when they see the chorus of saints possessing the liberty that comes from compassion --- all of them carrying off the incorruptible crown." Strophe 28: "Behold, therefore, these things are clearly revealed as to what calls men into the Kingdom. Then let us hasten to keep the commands of Christ. If we wish to buy it, the oil is on sale in the markets. Those who have it for sale are those in need of mercy; they sell it everyday. Why, then, are we negligent? Indeed, for two small coins we receive just as much as someone who has given a great deal of money. For the Creator of all examines our means and thus offers the incorruptible crown." Strophe 29: "The commandment of God is not harsh, for He does not command what you do not have the means to give; but He asks for our purpose. You have only two coins in the world? You own nothing more? Then the All-Merciful One receives these, for He is the Master; and He will give you preference over the one who has given much. Or do you not even have a small coin to offer? Give a glass of cool water to the one in need. Christ receives it with gratitude, as He most assuredly gives you the incorruptible crown." Strophe 30: "Taking a little, the Saviour gives back to us a great deal; for in return for transitory things, He grants the joy of eternal life. Give a bit of bread, and you will receive a paradise of delights in return for it. Poverty will not harm you, or want, if you have patience. You will not be subject to an audit of accounts; do not seek it. For the least one will receive pardon, while the powerful will be held rigorously to account. Become generous [so] that you may find the Kingdom, and that you may receive the incorruptible crown." Strophe 31: [St. Romanos ends his Kontakia with the following prayer]: "Remit my sins, pardon me, Saviour, condemned as I am by all men; for I do not do what I tell the people and advise them to do. And so, I fall down before Thee; grant me Thy peace, Saviour, and grant it to those who hear me, in order that we may keep Thy commandments - all of them - in our lives. And let us not remain groaning and crying outside the bridal chamber. Have pity on us with Thy compassion, Thou Who hast always willed to save all men. Call us, O Saviour, into Thy Kingdom, in order that we may have the incorruptible crown."